I can’t possibly start now, I don’t have all the right stuff! Major distraction technique, this. Of course I can’t start drawing because I need this, that and the other. Of course this is not true, but despite this I frittered away several happy weeks sourcing all the (supposed necessities) of my new activity. First of all the coloured pencils, I used a book by Ann Swan called ‘Botanical Painting with Coloured Pencils‘ as my guide to colour choices and then spent many happy hours making colour swatches. Now, this looks like a really nit picky thing to do, but I have to say I enjoyed every minute of it. 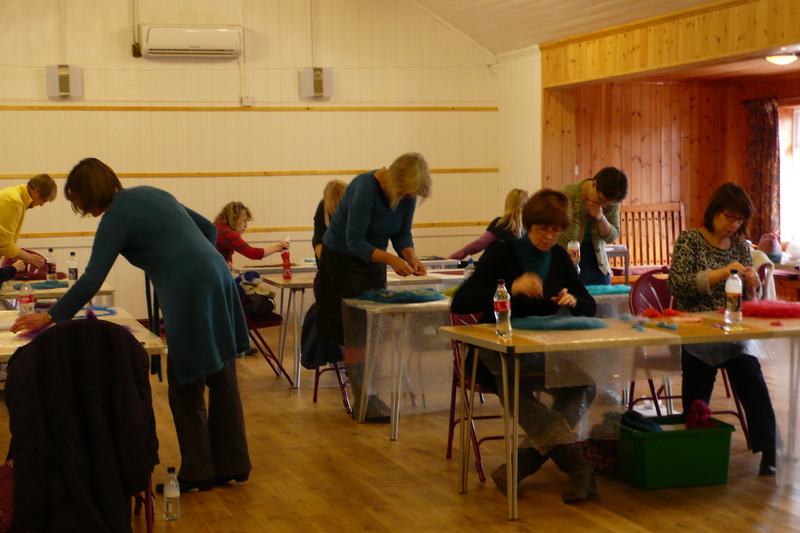 It was lovely to make little squares of paper and to colour them in, to see how different the colour was no the paper than in the pencil: then sorting the coloured squares into groups of like colours: then making paper strips and colouring squares again: then using sticky backed plastic to protect them: and finally to lay them all out and look at all the pretty colours. 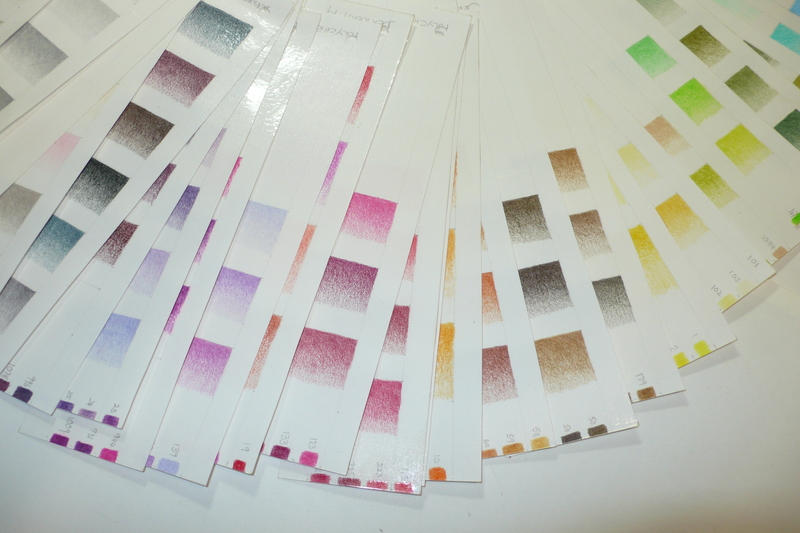 I should get out more, I hear you say…..
Well it may have been a labour of love, but I use the swatches for every drawing I do, so there! They help me establish the palette for the plant I am drawing. 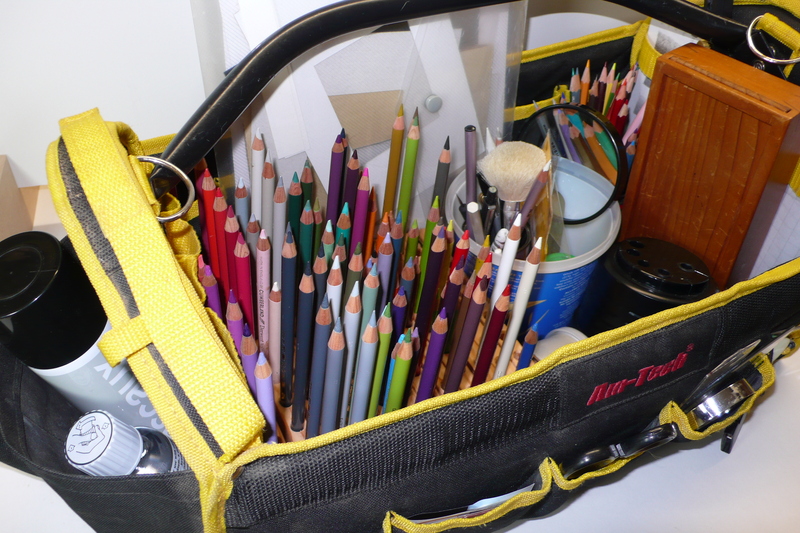 I have even found a stash of Derwent artist’s pencils from way back in the 70’s when I was at art school, so they have been sharpened and added to my kit. 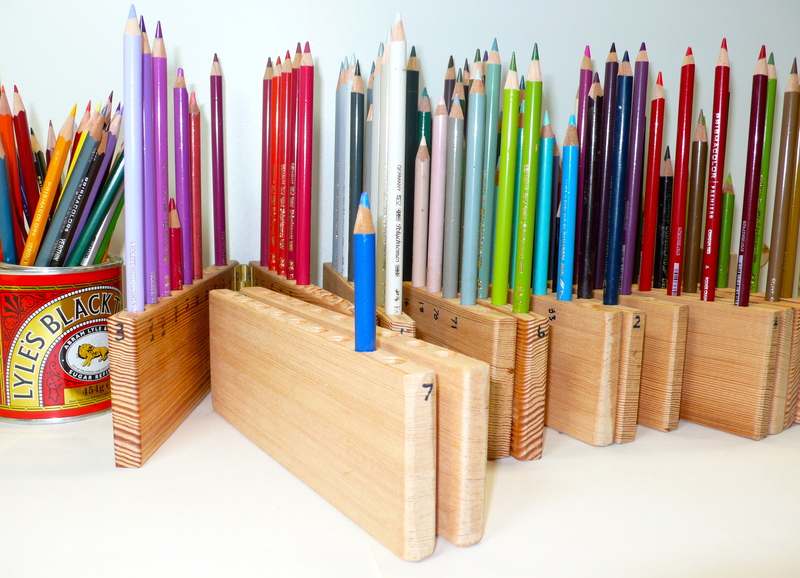 So now I had 100+ pencils and I must have a way to store them and find them – so with the advice from Janie Gildow & Barbara Benedetti Newton’s book ‘Colored Pencil Solution Book‘ I requested my DH to make some stands. And here they are in all their glory. Most are made of Cedar wood so they are lightweight and fragrant too. Each colour has its allocated place and the blocks have hinges so they open wide and stand alone. Then using both books as guides I collected together or purchased the remaining ‘essentials’. 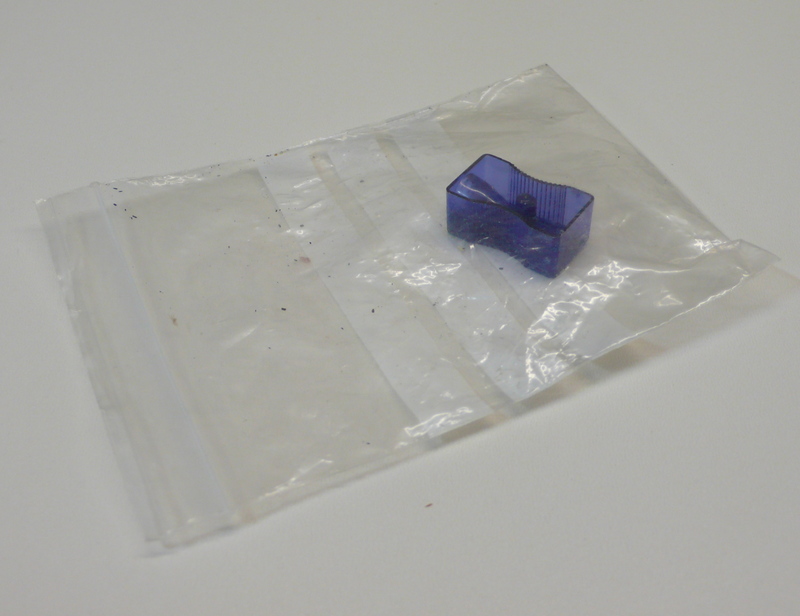 Best things in kit – 1) battery pencil sharpener, what fun and what sharp sharp points it makes & 2) battery eraser, it’s like holding an angry bee in your hand but it really works. 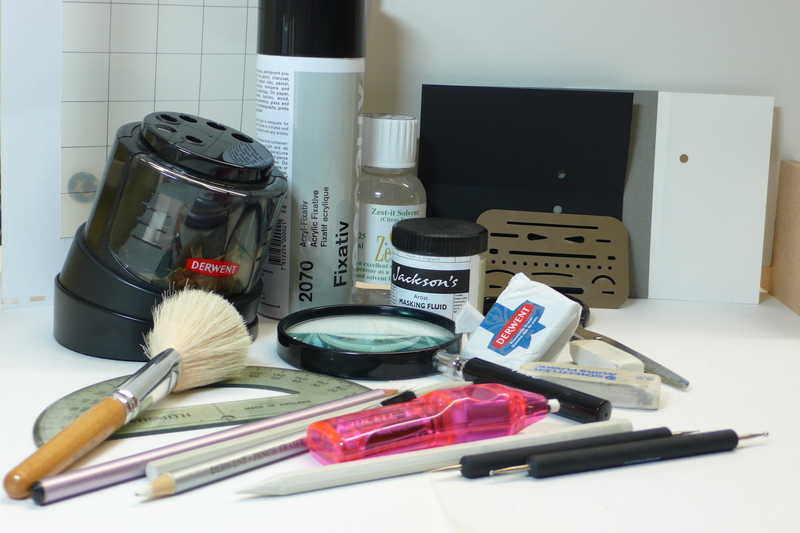 Also in kit – makeup brush for brushing away debris, blender, burnisher, embossing tools, kneadable eraser, eraser shield, fixative, masking fluid (not used yet), Zest It solvent (not used yet), value finders, magnifying glass, protractor, ruler, masking tape and on and on and on. But all was finally collected together and finally a spare tool caddy was found and all the equipment found a home. No more excuses time to get started. 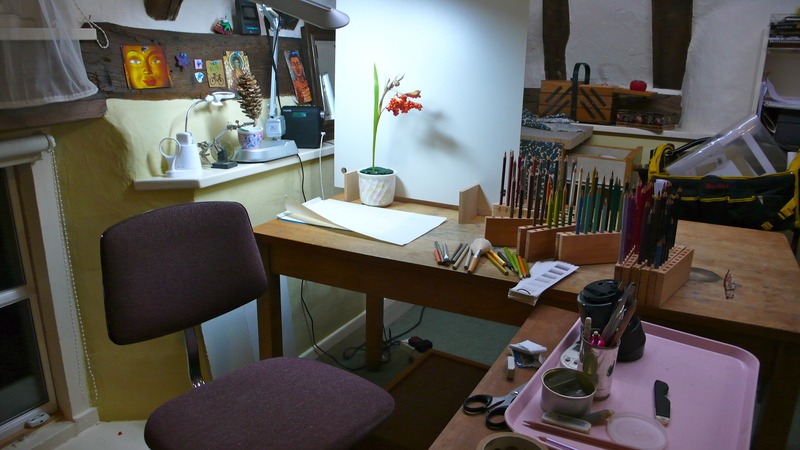 Here is my space all set up, the plant I am working on here is an Iris Foetidus and the picture was taken in December 2013. Below is the finished drawing. This entry was posted in art, Materials and tagged art, colored pencil, colour swatches, coloured pencil, drawing, drawing kit, kit on January 29, 2014 by Draws Shoots and Leaves. Travel is on the horizon and I want to keep up the momentum of my drawing practice so I need to take some equipment. But what to take and how to transport it? My full drawing box is a carpenters tool caddy and has a hefty weight to it. We are planning to travel on hand baggage only so weight and size are crucial. First to decide what is the minimum that I need; firstly a pencil & a sketch book then some means of sharpening (not a knife as it won’t be allowed in hand-baggage) and an eraser and finally some coloured pencils and a blender/burnisher. 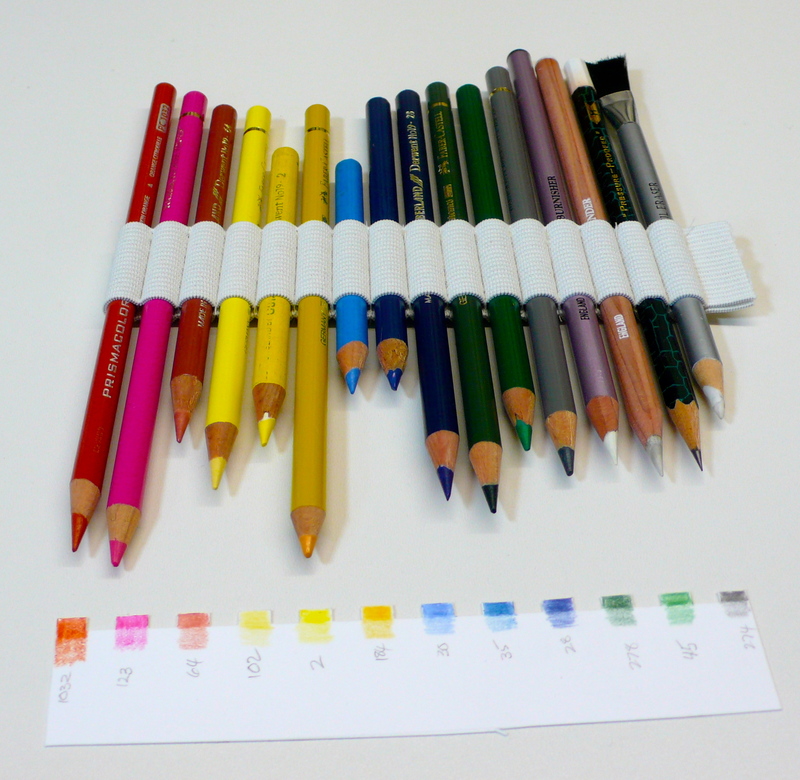 I used Jane Strother’s book ‘The Coloured Pencil Artist’s Pocket Palette‘ to help me choose which of my 100+ coloured pencils would earn it’s place to travel to foreign parts. These are the chosen ones and I made a little test card to see the colours. At the end of the row are a blender, a burnisher, a graphite pencil (H), and an eraser pencil with a brush; all held together in a holder made by making channels in a piece of elastic – genius I thought as now they won’t roll around all over the place! 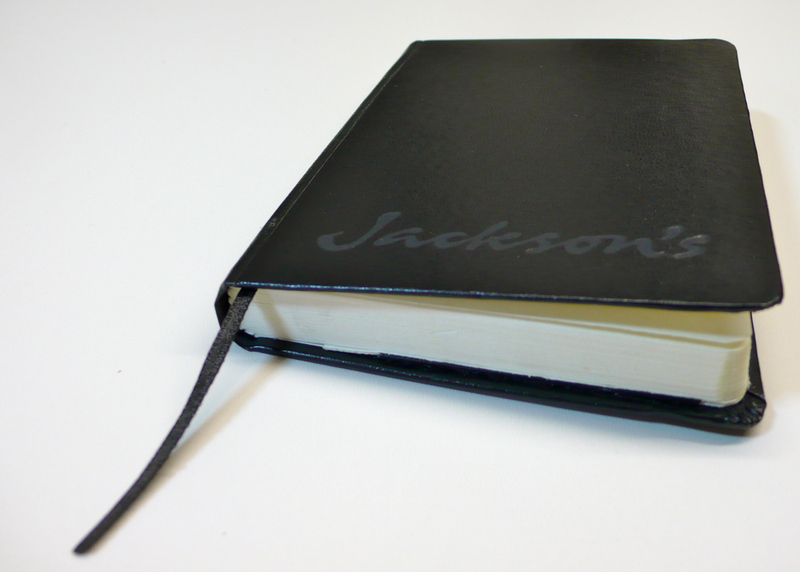 Sketch book has to be small too, so I chose an A6 hardback book with cartridge paper from Jackson’s Art Supplies. Pencil sharpener in self seal bag as I don’t want to drop pencil shavings. And finally a bag to put it all in. 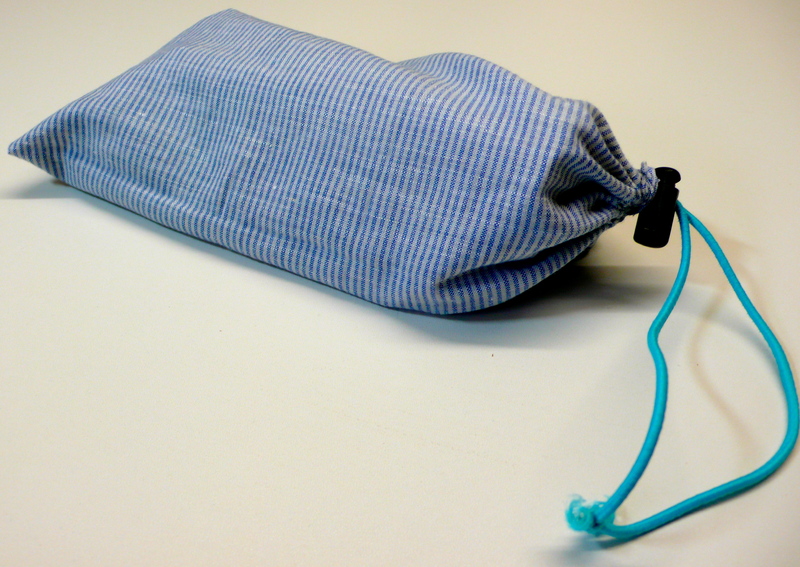 I found fabric, elastic and toggle closure in my stash and made a drawstring bag to hold it all. I am a little worried, as my pencils are sharp, will they be allowed onto the plane? I am going to have to take a chance on that and just keep my fingers crossed that I do not look like someone who will use a pencil as a deadly weapon. 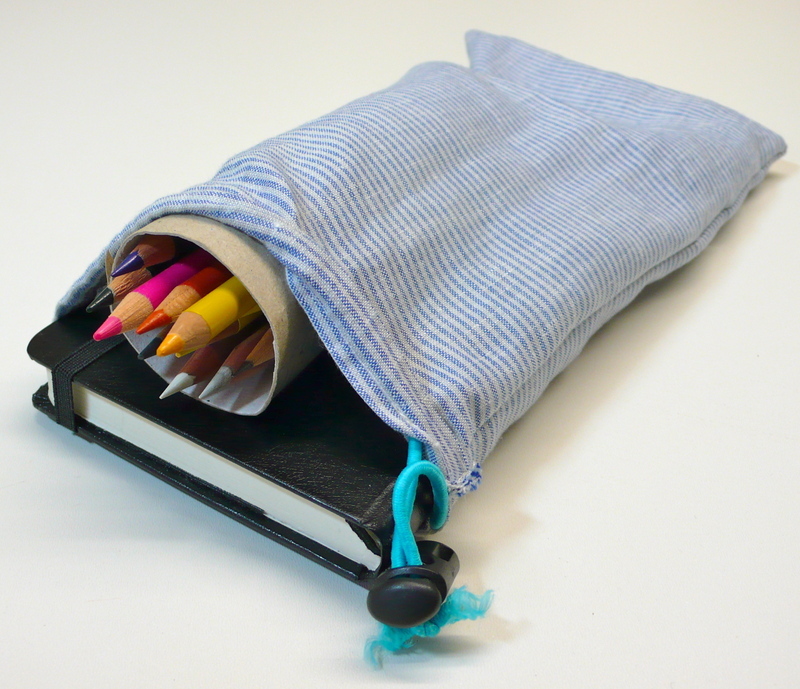 But the pencils are sharp so I raided the bathroom to find a tube to slide over the pencil roll to protect the tips. 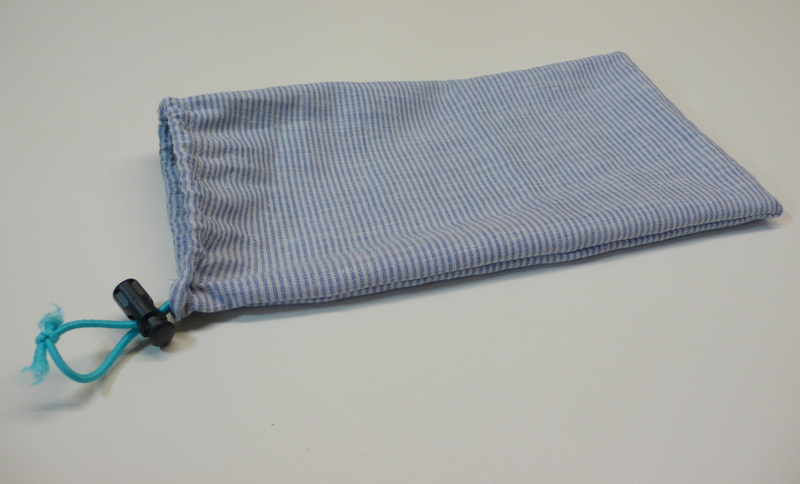 Now I just have to remember to use it when I am away……………. This entry was posted in Making and tagged coloured pencil, drawing kit, light weight, travel on January 23, 2014 by Draws Shoots and Leaves. And of all worldly goods have but two loaves left. During my searching for a new craft, I have been down a very longwinded, messy and smelly detour. This started 1) by having a lifelong interest in knitting & 2) deciding that I would like to make my own yarn. 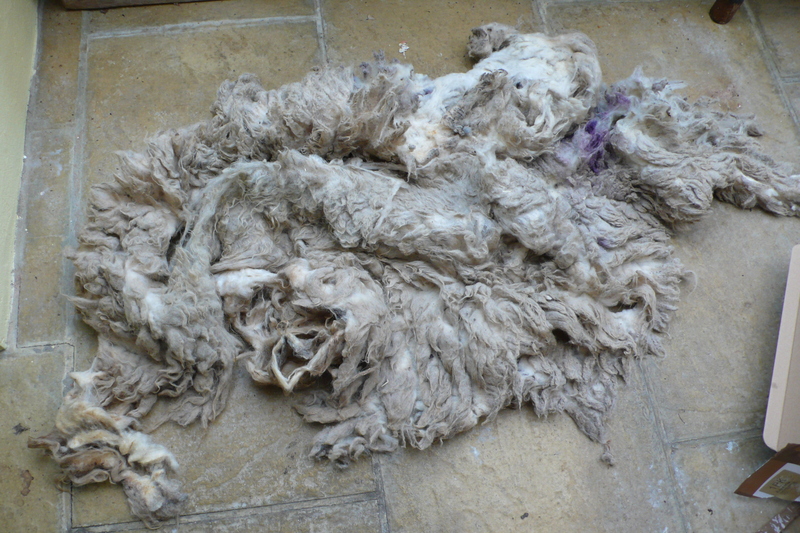 and the second consequence which was the smelly one was that raw sheep fleeces were given to me. Beware the person that gives you a fleece from a sheep. 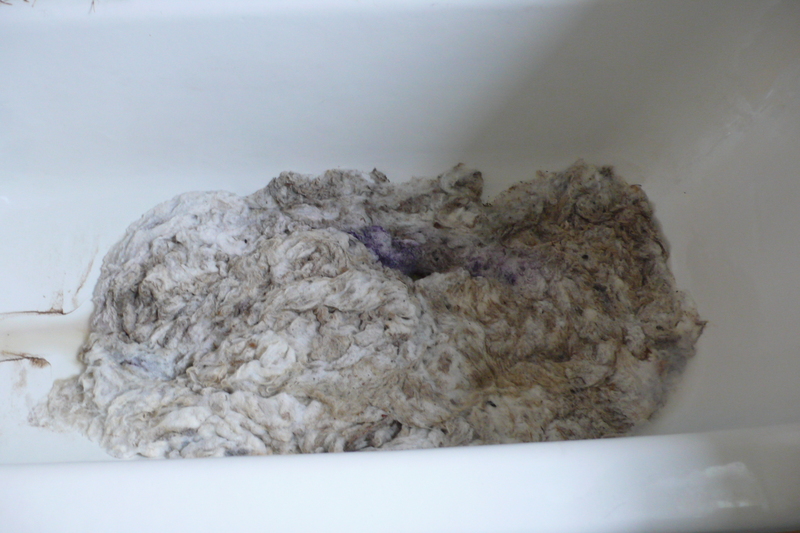 In my innocence I plunged the fleece into the bath full of hot water and it became wet and heavy as well as smelly and dirty – a wonderful combination (and not popular with the other person I share a house with). 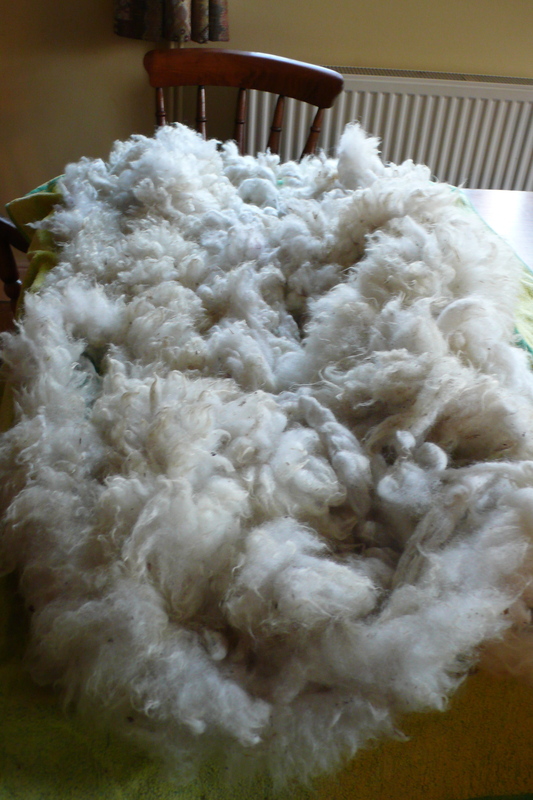 Anyway, I won’t go on about this any longer, but it took hours and hours and hours and I have enough spun fleece to knit myself a jumper which I suspect will resemble porridge both in colour and texture, I’m just waiting for a suitably lumpy pattern to come my way and I will get started. 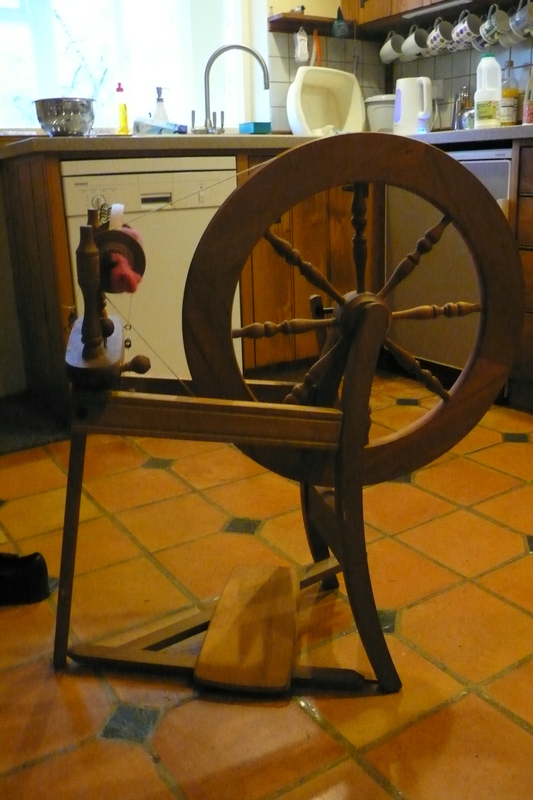 Another result was that I ended up with quantities of washed and carded fleece but absolutely no enthusiasm to do any more spinning. At that precise point, I was invited to join a new felting group Never Ever Felt Better that had just started up in the next village. Now there was the answer to my problem, and maybe it would be the craft of my dreams. All these crafts are so simple on the surface and so difficult in practice. I claim the prize in our group as the person who makes the ugliest felt objects. 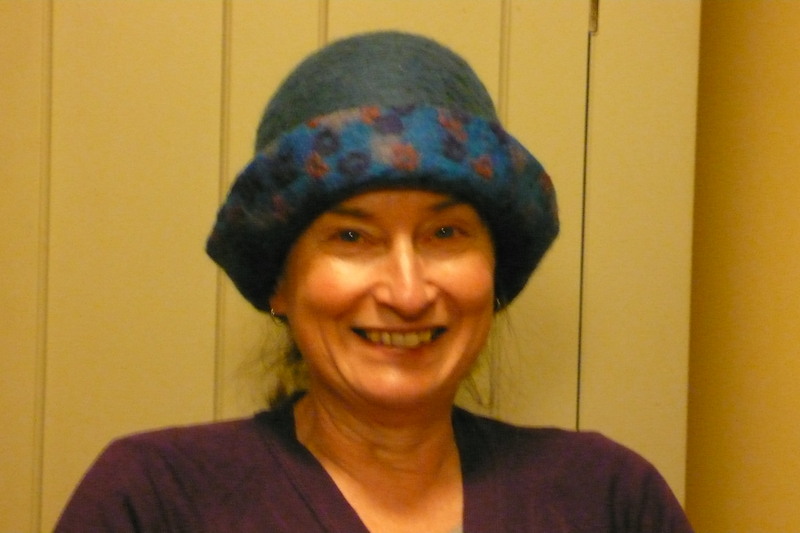 I have made a hat that is so thick and heavy the weather is never cold enough to wear it. 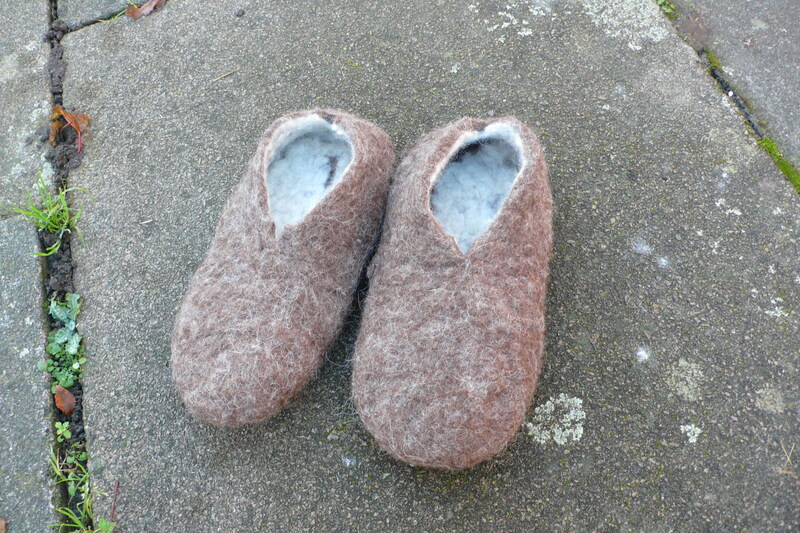 I have made some slippers that don’t match each other and fit no one. I have made some seat covers that are ugly but at least are warm on the bottom (if you excuse the expression). 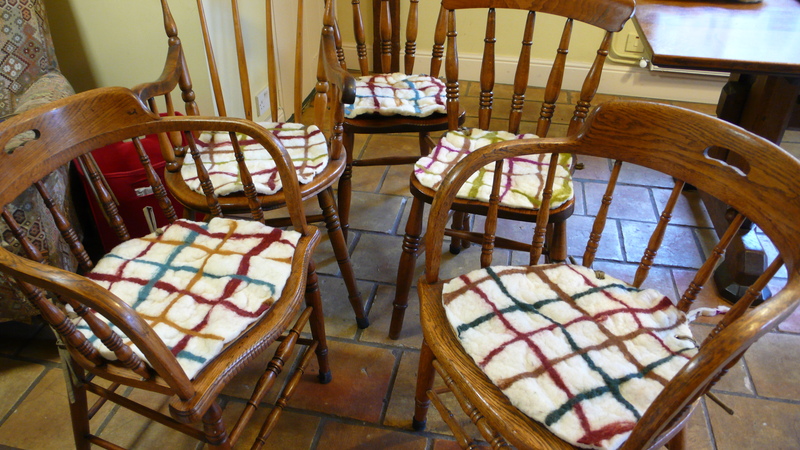 These now adorn all the chairs in the house, and have solved the problem for me of what to do with all the fleece I had stockpiled. The house is now amost a fleece free zone. 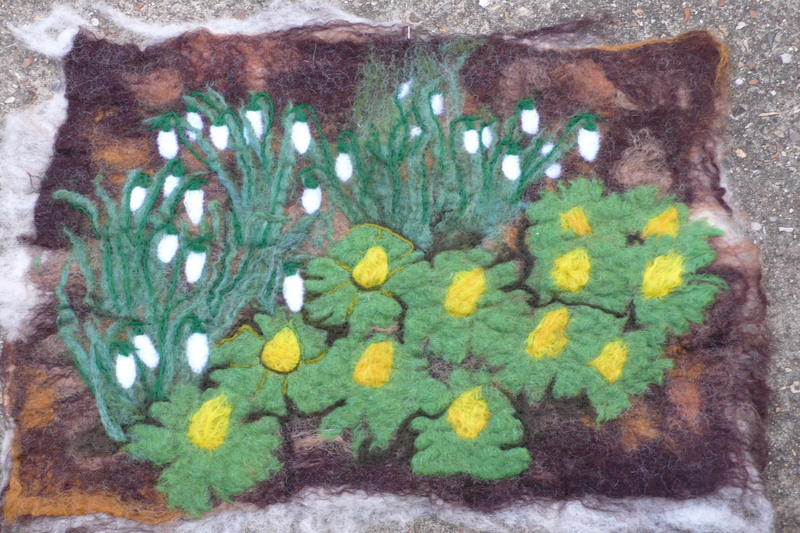 And once I had started drawing I realised that I could use the drawings as starting points for my felt making so I made some pre felts and using my sketches of snowdrops and aconites as reference I made my first felt picture. The base was wet felted and the finer details were needle felted later. I was happy with this and felt (ha ha) that there were possibilities for me linking the straight forward drawing with the craft element of felt making. 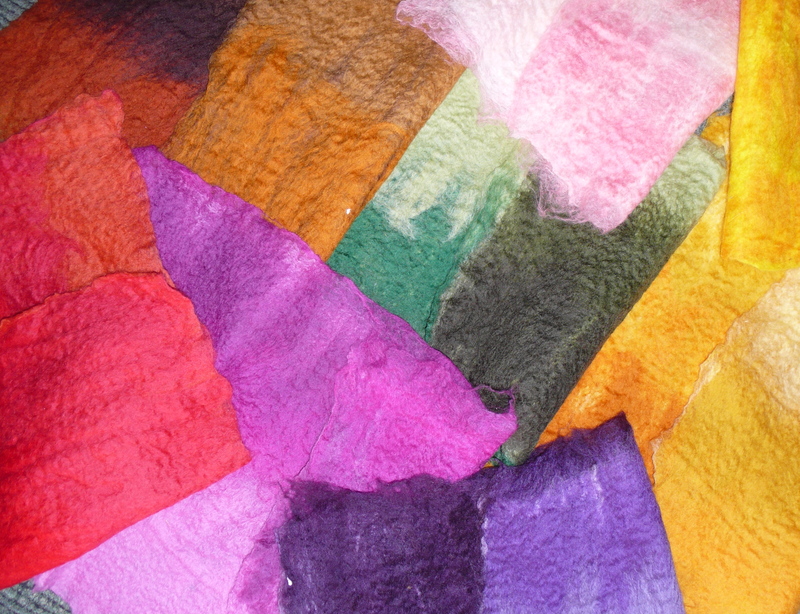 And this is where I am right now, I have just made a batch of pre felts which give me enough colours to get started with for my next felt picture. So there I sat one year ago with a blank sheet of paper in front of me and a pencil in my hand, I had delayed this point as long as possible. I had fiddled with the specimen; should it be nearer or further away, was this view better than that view? I had adjusted the lighting; from the left side, from the right side, was top lit better or worse. But finally the moment arrived when there was nothing more that I could do so there I was, me and a blank sheet of A4 paper, on the face of it that does not sound too terrifying, but there is something so daunting about the pristine surface and the knowledge of the ugly mark about to be inflicted. Why should that be? It’s only a piece of disposable paper, the world is not going to end, nothing is going to change, it’s only making a mark on a piece of paper. As I reflect on that angst it seems to be based in a fear of failure, of not creating the perfect image, of knowledge of what the image will look like before it is made and of not achieving – not achieving what exactly? Not achieving perfection, and why should perfection be achieved with the first drawing anyway? It’s a ludicrous idea. My pencil touched the paper, and I was off……… The images were as I expected – inexpert and poor, but I was doing it, I was drawing, I was looking at a flower very very hard and trying to capture the essence of what that flower was and what that meant to me. Over the next few weeks I continued to draw and gradually the fear diminished and to be honest it has never truly gone away, the first mark is the scariest. My confidence started to grow and with confidence came motivation, a positive feedback loop! I have added information about snowdrops, aconites and hellebores to my Plants page. This entry was posted in Confidence and tagged A4 paper, botanical artist, history, plants on January 11, 2014 by Draws Shoots and Leaves. What else does a botanical artist do but draw shoots and leaves and of course all the other parts of a plant. It is of course also a play on the book title ‘Eats Shoots and Leaves’ which was very popular a few years ago. After deciding that I wanted to do a blog about my progress as a botanical artist, I asked the family to help with finding a name. Much laughter and hilarity followed with some totally stupid and crazy ideas, surprisingly (or maybe unsurprisingly) many of the names where already in use but finally the name Draws Shoots and Leaves germinated. 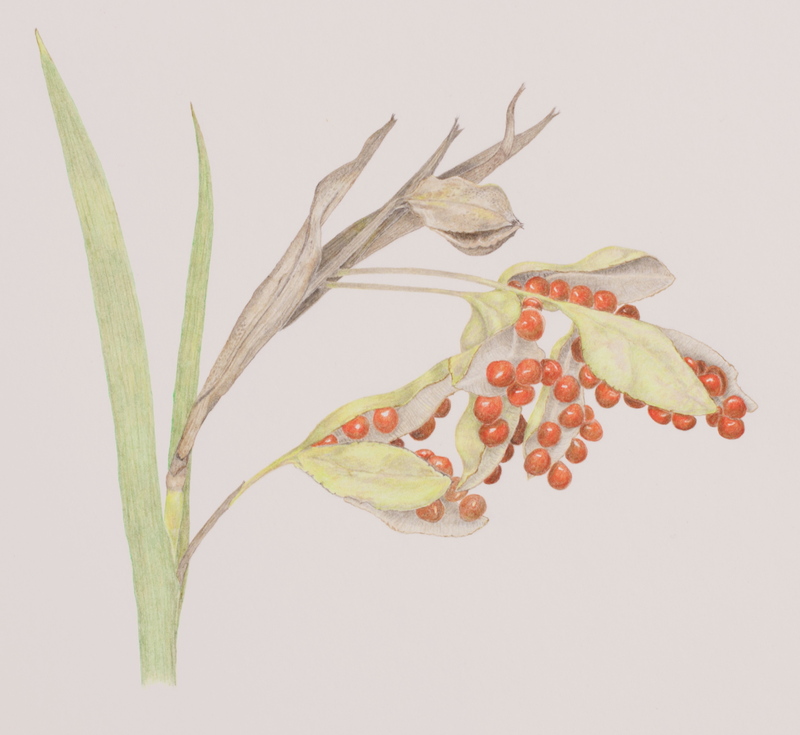 This entry was posted in Draws Shoots and Leaves and tagged botanical artist, history on January 7, 2014 by Draws Shoots and Leaves.